Want a beautiful lush lawn? Then you’ll need to feed it right! Without certain nutrients plants simply can’t photosynthesize, or survive. In previous posts, we’ve covered most of the macronutrients and micronutrients needed by your lawn and landscape plants. This week we’ll wrap up plant nutrients with Zinc and Iron, the two remaining micronutrients important to lawn vigor and strength. In the summer heat, lawns can often turn yellow, generally called chlorosis, due to a lack of either Nitrogen or Iron. 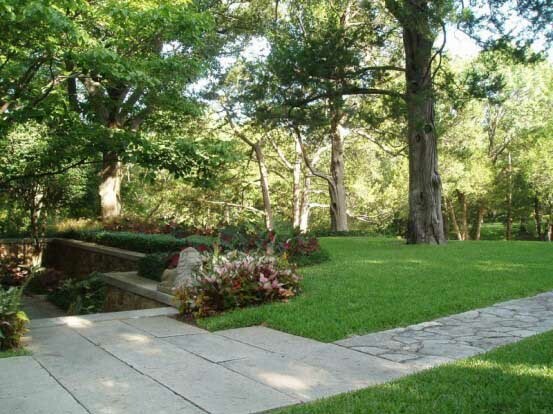 A great example of a landscape with balanced soil. Iron can be bound up in the soil when pH is high (above 7). Our soils here in the Dallas and Fort Worth area typically have a high pH. The heavy rains this spring also leached the soil of important nutrients such as Nitrogen and Iron. A result is chlorosis in lawns. Chlorosis is a yellowing of plant tissue and is often the result of an Iron deficiency. While plants only use iron in small amounts, they aid in a plant’s formation of chlorophyll, a pigment necessary for photosynthesis. If leaf blades turn yellow, with the mid-vein remaining green, then your lawn is most likely suffering from an Iron deficiency (although other diseases and nutrient deficiencies can mimic this appearance). While there is typically enough Iron in the soil, you may need to apply acidified products to your lawn in order to make it available to your plants. With our Soil Building program, we apply apply liquid compost, humate and earthworm castings to your soil to combat chlorosis. Zinc, which is only needed by plants in small amounts, helps plants with the production of proteins and growth hormones. Trace amounts of Zinc ensure healthy growth and a healthy harvest. Plants with a Zinc deficiency will appear stunted with less blooms and fruit production. Leaves also may be distorted. Organic matter, such as compost and earthworm castings, typically provide enough Zinc for your lawn and landscape plants. Top-dressing lawns with a thin layer of organic compost can help rejuvenate soil, reduce certain lawn fungal diseases and combat nutrient deficiencies. Adding a biostimulant to the soil will also help to loosen compaction and the breakdown of organic matter, which releases nutrients to your lawn. Want healthy, bioactive soil, but don’t want to do the work yourself? Our organic Soil Building program ensures that your soil is loaded with the right nutrients throughout the year so your grass is beautiful, healthy and Barefoot Approved™.